Come and join the team and have some fun! WOULD YOU LIKE TO BE A TWINNING AMBASSADOR? 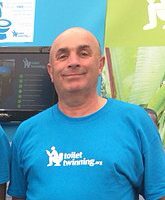 When it comes to being involved with Toilet Twinning, the sky’s the limit! Would you like to give a school assembly talk, or speak at a local community group or church service? We get requests from speakers from time to time, or you can organise your own talks. There are lots of resources to download, or you can ask us for a kit. If you like the sound of this, fill in an application form today! If you join us at a spring or summer festival, you’ll have lots of fun – and you’ll receive a delegate pass, accommodation, food and travel expenses. Take a look at our 2019 volunteering opportunities. Could you run, jump, hop, skip, cycle or pogo for Toilet Twinning? You can ask us for a sporty top, and we can help you set up a Virgin Money Giving page online. Fancy hosting a fundraising meal with friends? A toilet party? A do for a loo at your workplace? A stand at a local community event? Order your sale-or-return kit and do some on-the-spot twinnings in your local area! Skelmersdale was crowned the UK’s first Toilet Twinned Town when St Paul’s Church really caught the toilet bug! If you’d like to start twinning your village, town, city or island – please get in touch! Emma Tiller became a Speaker and Events Volunteer in response to the 2014 news story of the two teenage girls who were attacked in India as they went to the toilet outside. 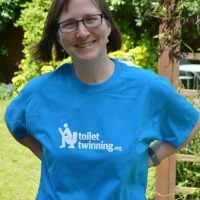 Emma has encouraged her church to twin their 12 toilets, spoken to a local Inner Wheel group that subsequently raised £2,000, and has taken assemblies in local schools. She’s also represented us at the Spring Harvest event in Skegness. Toilet Twinning’s very own postman became a volunteer for us on his retirement. Within two weeks of leaving Royal Mail, John found himself on the stand at Spring Harvest. Since then he’s joined us at Big Church Day Out, alongside his wife Helen.